You will need 4 players and one basketball for this drill. Start with one player at the free-throw line, two players at the baseline as passers, and one player in the middle of the lane as the rebounding player. The shooter will start with the ball in hand. The shooter start the drill with a shot from an area near the free-throw line. 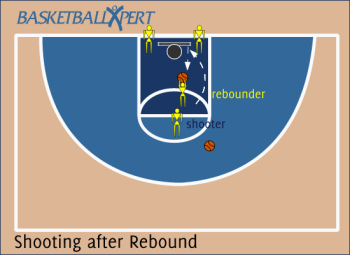 The rebounding player should rebound the ball from the backboard, keeps the ball high over head, and immediately put the ball back up at the basket. The players at the baseline immediately collects the shot from the rebounding player and kicks it back out to the shooter. The drill should continue for 1 minute and then players should rotate. Add a player inside the lane with the rebounding player to add extra pressure on the rebounding player. Rebounding player should focus on reading the flight of the ball off of the rim or backboards. Collect the rebound at it's highest point. Keep the ball high over head when landing. Put the ball back up to the basket as quickly as possible.